Millions of Americans have undergone sore gums. Sore gums can be painful and annoying, making it difficult for you to talk and chew gums. You’re flossing or brushing and see a painful sensation in the gums. Your sore gums may sometimes start to bleed while you are flossing or brushing. Many people often do not pay attention to the problem of sore gums because it is not usually very severe. But sore gums may be an initial sign of gum disease. 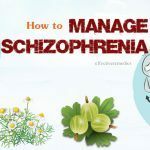 Luckily, there are multiple natural remedies to deal with it at home. 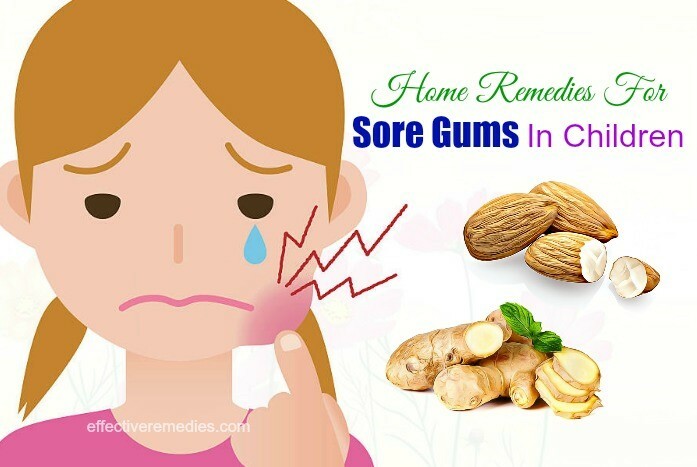 In this article, you will discover the most effective home remedies for sore gums in adults and children. Keep reading to know more! Salt water is an excellent remedy for oral problems. It prevents the bacterial growth and removes the one already growing in the mouth. It inhibits infections that may cause several oral health issues. It is also beneficial for neutralizing the pH of the mouth and soothing the inflamed gums. It further helps to alleviate the swelling since it contains anti-inflammatory properties. Use the soft-bristle toothbrush to brush your teeth. Then use some salt to rub your gums for several seconds gently. Afterward, use some warm water to rinse it off. Follow it once every day for quick relief.  Try this remedy thrice per week to prevent recurrence after the gums are healthy again. Just add the salt to the lukewarm water and rinse your mouth with it twice daily. Do not swallow the water. 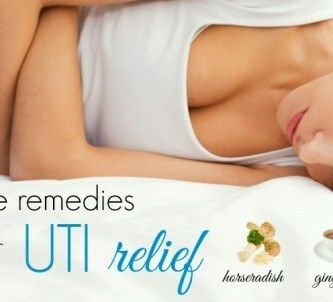 Caution: Remember that the relief is only temporary with this remedy. 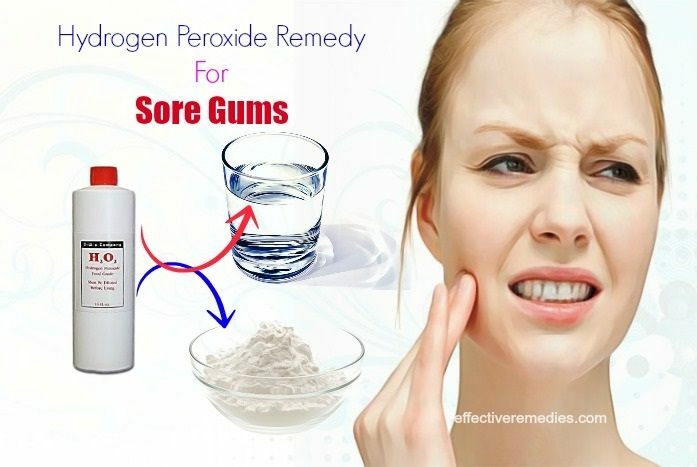 Hydrogen peroxide is an ideal remedy for calming gum inflammation and pain. Besides, it is helpful in killing germs and fighting other oral issues. Combine the hydrogen peroxide and water in equal parts. Then, begin swishing this mixture around your teeth and gums for around 30 seconds to one minute. Afterward, rinse it off with the support of warm water. Try this home cure 2 to 3 times per week. Prepare a paste by mixing the baking soda with sufficient hydrogen peroxide. Start rubbing this paste on your gums and rinse your mouth well after 1 minute with water. For quick results, use this treatment twice a week. Note: Make sure you don’t swallow hydrogen peroxide. Tea tree oil can deal with irritated and inflamed gums effectively since it embraces antibiotic and anti-inflammatory properties. In addition to this, it is perfect to treat other oral ailments such as receding gums and oral herpes infections. Moreover, it can fight off halitosis, a chronic bad breath caused by excessive bacteria in your mouth. Take the tea tree oil and mix it in the warm water. Then, use the solution as a mouthwash two times daily. You can also use toothpastes having tea tree oil to brush your teeth. It aids in easing discomfort. Follow it daily until the gums look healthy again. Caution: Ensure not to swallow this oil, as it can lead to stomach problems. According to a study, turmeric is a powerful antimicrobial quality and is excellent for decreasing inflammation and facilitating the healing process. It further helps to soothe the pain and swelling of your gums. Along with that, it prevents the activity of bacteria that contribute to a few oral problems. Mix the turmeric powder with some water to get a paste. Use your clean finger to apply the paste to our gums. Leave it on for roughly 5 minutes and massage gently for one minute. Use warm water to rinse your mouth. 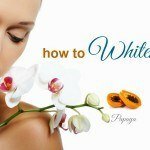 Try the treatment twice every day for 1-2 weeks. 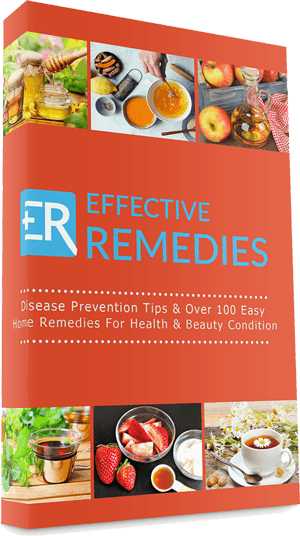 Caution: If you suffer from gallstones, ulcers, or bile duct obstructions, don’t use turmeric. 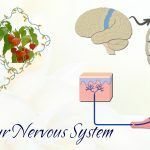 Also, avoid it if you are taking immune system suppressants, anticoagulant medicines, and non-steroidal anti-inflammatory drugs such as ibuprofen or aspirin. Pick up the aloe vera leaf and cut open it to extract the gel. Rub the gel on your gums with the support of your clean finger. Gently massage for around 1-2 minutes before rinsing with warm water. Reapply several times every day until the condition is improved. Caution: Taking aloe latex in high doses can cause kidney failure & other kidney problems. The tannins found in black tea bags are ideal for reducing the inflammation of the gums. In addition to this, it can enhance the oral health thanks to its antioxidant properties. Take the tea bag and steep it in boiling water for 2-3 minutes. Take the bag out of the water and let it cool. Now start holding the tea bag on your affected area for ten minutes. Use the warm salt-water solution to rinse your mouth. Repeat this method once daily for a couple of days. Caution: Drinking black tea in large amounts can cause health problems such as a headache, nausea and vomiting, or irregular heartbeat. Oil pulling can deal with inflamed gums and other dental problems. It additionally helps to decrease the bacterial growth in the mouth causing infection. Also, it even inhibits the formation of plaque and strengthens the gums. Just put the sesame oil in the mouth and swish it around your mouth for around 15-20 minutes. Spit out it and rinse your mouth carefully with warm water. Lastly, brush your teeth. For best results, redo the process every day in the morning before you brush your teeth. Note: don’t swallow or gargle sesame oil. Epsom salt is an ideal remedy for soothing the swollen gums and relieving the pain and inflammation. It can also treat the infection contributing to the problem due to its antibacterial agent. At first, mix the prepared Epsom salt in water. Next, garble with this mixture twice a day (in the morning & at night. Caution: Ensure not to ingest this Epsom salt water. Peppermint, tea tree and chamomile oils can do wonders in eliminating the sore gums. The chamomile oil helps to calm the inflamed gums while peppermint and tea tree oils are strong antimicrobial properties that reduce the pain and swelling of the gums. Add all the above essential oil to the water and afterward, rinse your mouth with this oil mixture for two minutes. Finally, use clean water to rinse your mouth. Use this mouthwash twice per day to achieve the desired results. Caution: Don’t swallow this mouthwash, since not all essential oils are safe to consume or to use orally. 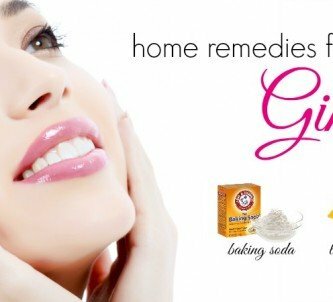 Baking soda is a potential remedy for people suffering from sore gums. Baking soda can battle the infection responsible for the swelling since it comes with antiseptic and antibacterial agents. Moreover, it can decrease the inflammation of the gums and ease the tender skin. Just combine the two ingredients well and use it to massage your gums. Afterward, rinse your mouth by using clean water. Repeat this treatment two times a day. Mix equal parts of baking soda and salt in a small container. For use, put around of ½ teaspoon of the homemade toothbrush in your palm and immerse the moistened toothbrush into it. Then brush your teeth and gum. It will leave your gums and teeth feeling clean and can decrease tenderness. Note: Never use baking soda regularly because it can damage your teeth. Use it once or twice per week at first and later continue this occasionally. Lemon juice is full of the acid, which prevents infections and maintains your oral health by destroying bacteria in the mouth. It further lowers the yellow tinge accumulated on your teeth, eliminates bad breath, and heals bleeding gums. Also, the anti-inflammatory agents and vitamin C housed in it are perfect for healing your sore and bleeding gums. Combine the juice with water at first and later gargle with this mixture. For visible results, gargle twice daily. Note: Don’t use lemon too often because its high acid content can damage the calcium level and tooth enamel. Clove oil possesses anti-inflammatory and antiseptic effects, which are effective in treating sore gums. 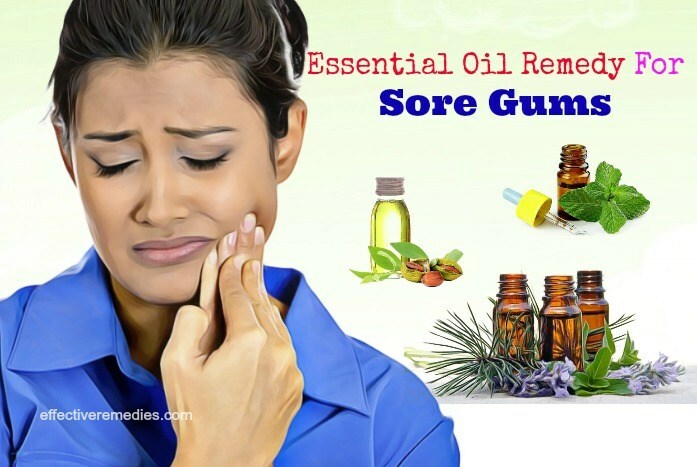 Besides, the swelling in the gums can be decreased with this essential oil due to its antimicrobial properties. It will also provide relief from any pain in your gums. Get the oil and apply it to your swollen gums. Massage gently and leave it on. You can also mix the clove oil with black pepper to reduce pain and inflammation. Reapply every few hours. Caution: Applying dried cloves inside of your mouth can cause irritation and sensitivity, and damage the dental tissues. Consuming clove oil may be harmful to children and may cause seizures, fluid imbalances, and liver damage. The baby’s gums start swelling and become sore, which makes the whole teething process quite painful and uncomfortable when his or her teeth begin to push their way out. 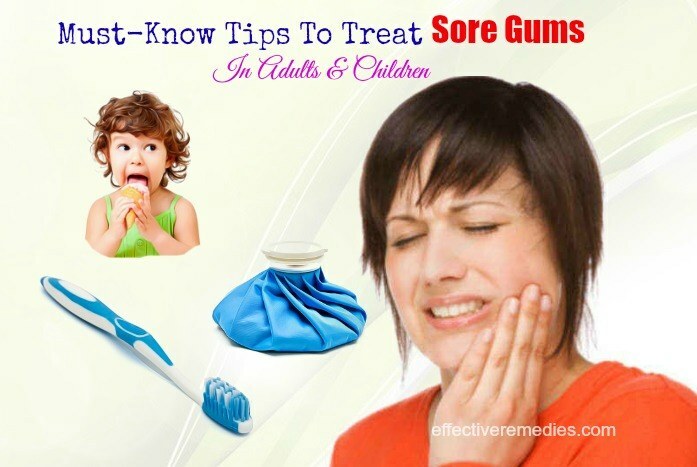 Below are some of the simple remedies and tips that will aid in decreasing the soreness in the gums of your baby. Ginger is a perfect remedy to cope with sore gums. It holds antioxidants, which will decrease the swelling in the gums. It acts as an anti-inflammatory once rubbed on the sore gums of your baby. Take the peeled ginger piece and massage your little one’s gums for several minutes continuously. People with bleeding disorders need to avoid consuming ginger since it’s a blood thinner so it may increase the risk of bleeding. Almond has been demonstrated to be useful for fighting swollen gums in babies. It provides a soothing effect on sore gums. Mix the almond extract with some water. Use a cotton ball or your fingertips to massage this mixture onto your baby’s gums. Repeat this process on a regular basis. The cold compress is ideal for reducing inflammation and swelling while the warm compress will assist in soothing the area. For this purpose, take a clean cloth at first and later soak it in some warm water. Then, wring it out and start holding it against the face over the sore region for around 5-8 minutes. Use a cold compress by wrapping some ice packs in a towel and holding it against the face over the sore part for two minutes. You should apply the warm or cold compress a few times to help soothe discomfort in the gum area. Sore gums can be a sign of gingivitis that is caused due to poor oral hygiene. So, you can treat the gingivitis by using fluoride toothpaste to brush your teeth. Brush your teeth well with a soft bristle brush. Be careful once you floss at your gum line, so you don’t irritate your gums more. You can find easily medicated oral gels on the market. They come with synthetic and natural compounds that aid in numbing and treating gum pain. 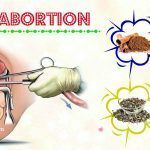 Besides, some even consist of pain-numbing compounds from botanicals such as Spilanthes or clove. Common OTC brands include Anbesol and Orajel. Follow the directions on the packaging. 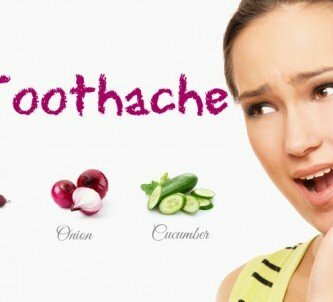 You can have some frozen grapes, a scoop of ice cream, or a freezer pop because they can assist in soothing your sore gums. Cold soup, pudding, and jello are also good choices. There are a few preventive ways you can take to stay away from swollen and sore gums, including eating healthy foods and maintaining proper oral care. Oral Care: Brush and floss frequently, particularly after meals. It’s necessary to visit a dentist at least one time every six months. If you suffer from dry mouth, it may increase the risk of tartar and plaque buildup. Consult your doctor about toothpastes and mouthwashes that may aid with this condition. Nutrition: Taking enough vitamin C, folic acid, and calcium can help to prevent sore gums. Those who do not get sufficient calcium on a regular basis are more prone to develop gum diseases. Folic acid and vitamin C can help to prevent gingivitis and maintain healthy gums. You should try adding these important vitamins in foods or talk to a doctor about supplements. Bleeding and sore gums can be an early sign of periodontal disease. So, you need to visit your dentist as soon as possible. Besides, including certain foods in your diet can aid in boosting the healing process and improving the health of the gums. Continuing to consume these foods after healing your gums may help inhibit future mouth problems. Vitamin C: A lack of vitamin C in the body may lead to sore or bleeding gums. This vitamin helps to boost up healing and maintenance of healthy tissues. So, your gums may become inflamed and start bleeding if you don’t consume enough vitamin C on a regular basis. Oranges are a leading source of this vitamin and eating one a day can help provide sufficient of this vital vitamin to heal the gums. Grapefruits, limes, lemons, broccoli, strawberries, and red bell peppers are also rich in vitamin C.
Vegetable Juices: Cucumbers are packed with minerals and vitamins. Cucumber juice can be helpful in absorbing the acid in the mouth, so the gums can begin healing. You can add some slices of cucumber to a salad or mix a few chopped cucumbers with tomatoes and onions to make a salsa for chips. The juices of some other vegetables including celery, spinach, carrots, and cabbage, have similar healing properties. Beta-carotene: Apricots are full of beta-carotene that the body converts to vitamin A. Vitamin A deficiency can contribute to sore, swollen, and bleeding gums, as the body needs it to maintain healthy tissues. Including vitamin A in your diet can be beneficial for encouraging your gums to start healing and preventing future gum problems. Other sources of beta-carotene are carrots, sweet potatoes, and spinach. Say goodbye to the problem of sore gums by following the above remedies and tips. Use them frequently without fail to obtain the desired results. 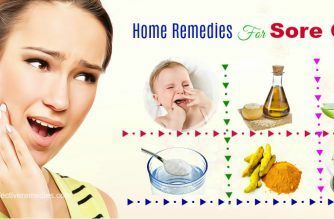 If you know other effective home remedies for sore gums in children and adults, please share with us in the box below. All of the contents provided in this article are for informational & educational purposes. We recommend you consult a healthcare professional to determine which method is appropriate for you.